You are currently browsing the Dublin Event Guide weblog archives for March, 2018. Dublin Event Guide 563: Happy Easter!! – Dublinia Viking Festival, Farmleigh House Easter Events, Mad Hatter Party. Happy Easter! For many this is a super long weekend from (Good) Friday until Easter Monday, others at least have three days off, but I always feel for people in jobs that don’t take breaks. Sure they also get time off (hopefully! ), but it’s often then not a big block like Friday until Monday. An important question at Easter is always “How will be the weather?” Nothing nicer than a sunny Spring Easter weekend, but we are not there yet. Still winter!! Temperatures will stay below 7 degrees! There will be a bit of sun on Saturday morning and clouds for the rest of the day. Cloudy on Sunday, but at least dry until 19:00 and on Monday? A lot of rain, the whole day! Still no Spring! Enjoy the Easter weekend anyway! I am super late again, so I had to push the events list out on Facebook. If you don’t follow the Dublin Event Guide Page on Facebook, you should definitely do that. Now that I have added another 40 (!) events for during the week, finally the mail goes out. Sorry for the delay again. On the donation bad news last week turned into amazing news thanks to one donation via the GoFundMe platform. For the March bill we still needed EUR 120 last week and that went down to EUR 70, but the great news is that the whole bill for April is already paid thanks to Eamonn McG. Thanks a lot! Please help me with the EUR 70 and then I will shut up about donations until the last week in April. :-) To help, I am suggesting a very fair EUR 12 for the year, that’s just 23 cent per Dublin Event Guide Edition or less than 3 pints for the whole year! That’s not much if you think about how much value the Dublin Event Guide brings you every week! ;-) Higher and lower donations are also appreciated! Every Euro counts! Some people think that this is the Law of Attraction, but that is a misconception. There is no automatic “Law of Attraction”. That idea is nonsense that you just have to believe that you will win the lotto and then you will win it. No, you will AT LEAST have to buy a ticket. And it is similar with all the other things you want in life: If you don’t work towards it, not much will happen, BUT if you don’t really believe in something it will ALSO not happen. Why? Because you won’t really work towards it!! Last week Debbie C, Karen McG, Eric C, Irish Family Names, Tom McM, Aishling B, Ana RT and – with a separate mention for a BIG donation – Eamonn McG were so great to help with a donation. Thanks a lot!! You and all the other donors throughout the year are keeping the Dublin Event Guide alive! Without you, there would be no Dublin Event Guide!! Ann Marie S, Gerard B, Luz McC, Nicola R, Caitriona D, Eva B, Ann C, Jutta B-S, Moira dF, Roisin R, Tracey O’C, Donna M, Jessica G, David S,Brendan R, Joan S, Stuart N, Filippo G, Gregory F, Mark C, Deirdre M, Howard L, Paul R, Linda McD, Isidro G, Gemma O’N, Aoife M, Anita W, Mark R, Clodagh O’C, Niamh D, Odhran K, Belinda B, Eimear L, Brian R, Andrew G, Marta T, Linda C, Grainne F, Rita B, Rosemary K, Mary McK, Ger O’B, Alison J, Sinead L, Lesley C, Noel N, Majella M, Mona O’R, Leigh P, Eric C, Anette K D, Aoife G, Aidan C, George K, Rita B, Thomas G, Roy C, Jutta B-S, Lorna O’C, Aisling McK, Miriam L, Fergus O’T, Julia Sch, Helen B, Susan H, Paula R, Justin M, Tony B, Ross M, Daniel L, Susan F, Joan S, Rachel McG, John F, Ann Marie S, Melanie B, Magdalena H, Leigh Ph, Mark G, Joanne M, Louise F, Kathryn H, Ornaigh G, Eamonn U, Gerard Ph, Fiona F, Gabriel K, Laura C, Aislinn T, Barry M, Joan S, Nicole W, Tara R, Denise G, Ann M, Mairin M, Daire O’C, Anne H, Anne H, Comet Records, John F, Nora O’K, David O’K, Karen+Brian F, Estelle K, Ann McP, Noelle H, Pat M, Meav Ni M, Jutta B-S, Jamie C, Leigh Ph, Irene D M, Michael D, Joan S, Melanie B, Anita W, Maria F, Moira dF, Arthur D, Catherine G, Clodagh C, Elaine K, Majella M, Ann M, Clodagh O’C, Claire R, Leigh Ph, Sarah L, Mark G, Erzsebet H, Isidro G, Karen A, Sean S, Melanie M, Zelie McG, Lindsay R, Thibaut D, Pia O, James B, Marguerite D, Shai C, Susan K, Agnieszka S-S, Alice K, Ieva B, Ruth L, Ana RT, Rita B, Sueanne O’H, Rosemary M, Darragh D, Lorraine S, Helena S, Carija I, Pat McK, Jennifer R, Sophie P-L, Jenny B, Catherine F, Stephen S, Juliana A Y, Caoimhe NiM, Damien B, Shane O’B, Melanie S, Audrey H, Catherine E, Michele McN, Susan B, Sharon K, Bill G, Malachy B, Catherine O’S, Paula R, Pamela A, Eleonora P, Thomas B, Karen K, Brendan M, Eric O’F, Gale G, Daniel LG, Mark G, Margo C, Joan S, Debbie C, Karen McG, Eric C, Irish Family Names, Tom McM, Aishling B, Ana RT, Eamonn McG and Travel Agency “Project Travel” (www.project-travel.ie Ireland’s only Norway and Northern Lights Travel Experts), Arthur’s Pub (www.arthurspub.ie A classic Dublin old-style pub in 28 Thomas Street with a new and buzzing music venue that runs lots of events), the Speedfriending Ireland Meet-up Group (www.meetup.com/Events-Drinks-Talks-Dublin/) (Where you can meet lots of new people and make friends), Cycling Campaign (www.dublincycling.ie), www.oliviercornetgallery.com (An Art Gallery in 5 Cavendish Row), www.thepaulkanegallery.com (A great Art Gallery, on the search for a new venue), www.cfcp.ie (The Centre for Creative Practices is the the only arts centre in Ireland dedicated to connecting, integrating and promoting immigrant, experimental and emerging artists among the local arts scene and audiences). 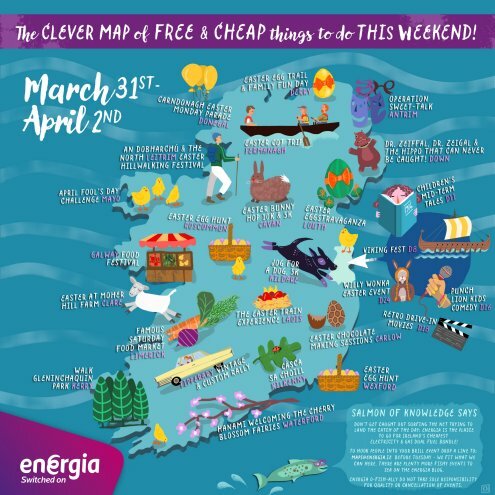 This weekend, the Farmleigh House Easter event, the Dublinia Viking Festival and the Mad Hatter Tea Party in Deer Park are probably the highlights! Have a great Easter weekend! Lica B Browne, Entrepreneur, Artist, Writer, DJ, Healer and Teacher, is running a Meditation Workout on Sunday 08 and 22 April. Tickets to the event are EUR 15, but Lica is making one place available for Dublin Event Guide Readers and to win a place you have to go to her booking form here and put one place in the basket. Then you go to Checkout and enter the Coupon Code DEGLBBmedapril to enter the competition. Please note: Your contact details will be passed on to Lica in this procedure. “This is where we make you sweat like a honourable mindfulness learner. 1) No hiding behind closed doors. 2) Meditation group games & art therapy. 3) Smack bang in the middle of life’s hustle and bustle (2 hours in a pub, a library, a gallery, you get the idea). 4) No practice mysteries. We meditate, discuss, meditate and on we go. Since a 2 litre bottle will experience a price increase of 60 cent, you can indeed save some money if if you fill the spare room with bottles in the run up to the tax introduction. Only problem is that all these drinks have a best before date and they really change their taste and the level of fizziness after that date. If you have ever tasted expired Coca Cola, you know what I am talking about. The good news is that you can postpone “The Big Bottle Buy” for a little. The tax will now get introduced on 01 May instead of 06 April. The Department of Finance has decided to check if the tax doesn’t break EU rules and that will take another bit of time. [You might wonder why I am saying it is “totally nonsensical”? And if you care, here are some of the reasons, but there are too many reasons to go in detail for all of them, so just a list: 1) Unless all sweets are taxed (and maybe fast food as well?) it doesn’t make sense to single out ONE food type. 2) It is very unlikely that a 60cent increase will dramatically change buying behaviour. We have the most expensive price for cigarettes in the whole EU and there are still PLENTY of smokers buying cigarettes completely independent from their financial means. 3) Adding a tax is NEVER a good way to get people to understand what the problem is and to be interested in changing it. Education is the RIGHT way. 4) If you try to “educate” through a price increase, you have to make sure that that increase is felt by the customers. Manufacturers, however, decrease the bottle size to 1.75 or 1.25 litres at the moment so that the consumer THINKS that the price has not increased. The sugar tax increase should have come with an obligation to keep the bottle size at 2 litres as before. 5) Did you know that a sparkling drink with added sugar will NOT experience a tax increase if it is an alcoholic drink? It clearly shows how serious the government is to keep people healthy. Sugar is cool when in alcohol, but sugar in a non-alcoholic drink makes you obese. Dohhh! 6) The final argument for me is that someone who eats an otherwise reasonably balanced diet but occasionally likes a sugary sparkling drink should not be punished by any state for this. Nanny-state is the term that is often used in this context. And if you think the Irish state really cares, then check out the quality of the drinking water in Ireland. ALL countries in Europe accept now that Fluoride in the drinking water is a BAD decision and in some countries a Fluoride-addition is totally forbidden. In Ireland the State still claims that it is healthy. Not true! The Dublin Bikes Scheme announced an expansion to the scheme by four additional stations (one at Smithfield and three at the DIT campus in Grangegorman) and another 11 are planned to open in the next few months. In total the number of bikes will increase from 1500 to 1600. That’s definitely good news, but the news of an expansion outside the canals is still LONG overdue. The next news will put the Dublin Bikes scheme under severe pressure. Dublin City tried to delay it as long as possible, but it seems that they can’t put their head in the sand (or aggressively refuse permissions) too much longer. Dublin City has announced that stationless rental bike operators can now apply for a license. You might have seen these new bikes in Dun Laoghaire Rathdown and in South Dublin County already and it was just a matter of time when Dublin City would also have to allow them in. The first company that tried to put bikes out a few months ago was dramatically “kicked out” with a threat of cutting the locks of their bikes and removing the bikes. The stationless bikes don’t need elaborate bike stations like the Dublin Bikes, but strictly speaking they are not as free moving as the bike rental companies would like. Instead the “stationless bikes” will need to be stored at designated bike racks and stands. That takes a little away from the ideal situation because you still will have to find/get near the pickup and drop-off location. Also the new bike companies will not give you a free first 30 minutes of usage with your membership. They will charge right from the beginning of usage, but because there is no membership charge the new companies will attract people that use bikes not so frequently. I will tell you more when the new companies launch. The Science Gallery is a really cool place and if you are a long term Dublin Event Guide reader you know how much I love the gallery and the exhibitions. About 5 years ago, they opened a Make Shop in Lincoln Place, next to the Dental Clinic and kind of opposite of the Clare Street entrance of the National Gallery. The Make Shop is a great space for learning how to craft electrical toys and usable items for a very very low price. You can build a radio or a torch with a small number of components and learn how to solder and lots of other things. Ideal for kids, but also suitable for adults. An initial buzz kept the place busy for a while, but since then it became a nearly ignored cousin of the Science Gallery. There were hardly any promotions for it lately and I would imagine it is relatively quiet there week after week. Unsurprisingly, but still sadly, the Make Shop will close now on 07 April. It will be a loss! Here are some further details. LAST chance to do discover your technical creativity and make that radio or torch etc. Don’t miss that final opportunity. Sir Frederick William Moore (1857-1949 – Curator of the National Botanic Gardens) has had nine species of orchids named in his honour due to his specialist approach to these flowers. Inspired by Moore’s ties to the orchidologist Heinrich Gustav Reichenbach, botanic artist Margareta Pertl will exhibit paintings of all of the plants named after Sir Frederick Moore. Alongside Pertl’s works, Deborah Lambkin, currently the official artist to the Royal Horticultural Society’s Orchid Committee, will showcase her illustrations of recently award-winning plants. Orchid associated material from the National Botanic Gardens archives will also accompany the exhibition along with a fine art print catalogue and elaboration on the tales of the depicted orchids by Brendan Sayers. The exhibition will be on show in the Gallery Space of the Visitor Centre. Admission is free. Join Irish author Liz Nugent as she chats with Declan Burke (Dublin City Writer in Residence) about her third novel Skin Deep, to be published in March 2018. Liz’s first novel Unravelling Oliver won the Crime Novel of the Year (2014) at the Irish Book Awards. Her second novel Lying in Wait, released in July 2016 went straight to number 1 in the Irish Bestseller lists and won the RTE Ryan Tubridy Show Listener’s Choice Award at the Bord Gais Energy Irish Book Awards. Dublinia, Dublin’s Viking Museum, is running a Viking Fest over the Easter weekend. It starts on Friday and runs until Monday. There will be a number of events in Dublinia and admission tickets are required for that, but some events will be outside where no tickets and no booking is necessary. An audio visual and theatrical performance at the Wood Quay amphitheatre is also free, but all tickets are gone already. + Swords, shields, spears, bows axes and the skills and tactics of Viking weaponry will be on display in the Dublinia courtyard. Viking coin minting will also be demonstrated as well as Viking crafts like tablet weaving. Re-enactors will demonstrate how to use a quern-stone and how to play some Viking games. + Two Viking longships will be moored at Wood Quay on the Liffey and a full size longship will be on the ground on Wine Tavern Street with lots of Viking Warriors to tell you all about the ship and life for them as it would have been a thousand years ago. Most Shopping Centres in Dublin run some sort of Easter events. Sometimes it is just face painting and ballon modelling, but a good few shopping centres also have Easter Egg Trails or some games. In the Square in Tallaght, it will be a Willy Wonka event from 13:00-16:00. In Jervis Shopping Centre there will be Easter themed craft and arts workshops from 13:00-17:00. All Shopping Centre Easter events are typically free. “Treasures of the National Museum” is a tour of the iconic treasures in the National Museum, including the ‘Tara’ Brooch and the Ardagh Chalice. Admission is free. Suitable from Age 7. This protest “against gender based violence” is a direct result of the trial against the Irish and Ulster Rugby low lifes who got acquitted of all charges last week in Belfast. The protest will take place on Barnardos Square, which is directly next to City Hall. The Ben Prevo Band and the band Supafreak will play a gig in the Bowery. Point Break will play a gig in the Harbour Bar in Bray. Pre 1960 acoustic Blues will be played in the Solely Blues Club on Saturday. The Vulypnes will play a gig in Sin E and they will be supported by Bayonets and also Kiss my Acid. Revolver are back for a gig in the Porterhouse. A new weekly Car Boot Sale will take place in Dun Laoghaire just at the fromer Ferry Terminal. It is a huge car park and there will be a Carboot Sale and a Gourmet Market with spaces for small businesses, antiques & collectibles, gourmet food vendors and people clearing out their home and selling things from their car. Admission is free (for buyers). After a long closure in the first three months of this year, Farmleigh House is inviting for their Easter celebration this Sunday and Monday. + Easter family games (run by Early Childhood Creativity Co.) in a Marquee near the Pleasure Grounds from 11:00-16:00. + Puppet Shows (30 minute) at 12:00, 13:15, 14:15 and 15:15 in the Cowshed (Admission is free. First-come first served). + Blanchardstown Brass Band will play from 14:00-16:00 in the bandstand. The National Botanic Gardens run “Kids Drop by Activities” on Sunday and Tuesday of this week. The New Market Collective is a warehouse market on the first Sunday of each month. You will find there Clothes, Accessories, Vintage, Home-Decor, Craft. Irish Design, Art, Vinyl Records, Jewellery, Food & Coffee and Live Music. There is also a Craft Corner. This is an art-making workshop where children and their parents/guardians/carers are encouraged to work together on creative projects. Drop-in and stay for as long (or as little!) as you wish. Admission is free. Suitable for children of all ages. An Easter Sunday Commemoration Ceremony takes place at the GPO and the President will be at this event. The Defence Forces Brass Band and a pipe band will play. Lots of army, naval service and air corps personnel will be there. The 1916 proclamation will be read and a wreath will be laid. The public is invited, but you have to be there super early. Oddly I couldn’t find any details, but usually when the president arrives the great unwashed have to be there at least an hour to 1.5 hours before him. O’Connel Street will be closed from 05:00 until 15:00, so avoid the area. I would expect that the Luas will also not operate on O’Connell Street until well after the ceremony. Should you go to it? I would say NO. It seems more like a “box ticking exercise” year after year with not much more going into it than what has to be. Even RTE has decided not to broadcast the event anymore, it seems. The next concert will feature Francesco Turrisi on piano performing “Northern Migrations”. Composed and improvised piano music from Turrisi’s new recording. This is the screening of a documentary exploring “The Taking of Christ” by Caravaggio. It is part of the BBC series “The Private Life of an Easter Masterpiece”. The yearly “Mad Hatters Tea Party” organised by Dun Laoghaire Rathdown will happen this Sunday in Deerpark, Mount Merrion. There will be lots of activities: an Easter Trail (solve the clues spread across Deerpark to win one of the hundreds of Easter treats that the Easter Bunny delivered), make your own Mad Hat and get a chance to win the Grand Prize for the Maddest Hat at the Tea Party Hatwalk Fashion Show, The Teacup Ride, Bouncy Castle and other Inflatables, Facepainting and more. And all the favourite Tea Party characters will also be there in their Easter finery including Alice, the White Rabbit and the Mad Hatter. You can bring your own picnic, if you want. A puppet theatre performance suitable for all ages by the Moon & Sixpence Theatre Company will take place at 13:30 and at 15:00. During these workshops for 4 to 12 year olds, they will explore paintings, sculpture and architectural features through discussion and drawing. Admission is free and no booking is required, but numbers are limited. The Bank Holiday Easter Sunday Party at The Workman’s Club will feature Montauk Hotel and Bicurious with Special Guest Daniel John Paxton. The gigs will be followed by The Karaoke Club and DJs. “Le Boom” and “Mix & Fairbanks” will play a gig in the Harbour Bar. This is a traditional singing meet up and singing session that happens on the first Sunday of the month. At most events a guest singer will perform as well. This month the guest singer is Eugene McEldowney. Another bank and public holiday! Hurray! But different from 2015, 2016 and 2017 there is NO special big event happening this year that has to do with the Easter Rising. In 2015 it was a “Year before the Rising” event in O’Connell Street, in 2016 then was the massive commemoration organised by RTE and in 2017 there was the brilliant Cruinniu na Casca that brought a big buzz and lots of people to Dublin. I was hoping that this series would continue, but unfortunately it already stopped and I guess the Easter Rising is going back into its box. + Some music in the bandstand from 14:00-16:00 is very likely. The programme for Monday is most likely he same or very similar to the Sunday programme, but the website doesn’t list the Puppet Shows and the Easter Egg Challenge and also doesn’t tell us if there might be another band in the bandstand. The Remedy Club will play the bank holiday gig in the Harbour Bar. Professor Rob Savage (Boston College) is a Visiting Research Fellow (in collaboration with the School of Histories and Humanities). He is currently writing a book about censorship and the Northern Irish ‘Troubles’ and will speak about how censorship of the broadcast media was pervasive throughout the island of Ireland in the 20th century. The lecture series “Irish Women and the First World War” explores different aspects of Irish women from anti-enlistment activism to working in munition factories and war-time nursing. The final lecture assesses the legacy and long-term impact of the war on the role of women in Irish society. In parallel there is also the exhibition “Doing their Bit: Irish Women and the First World War” on display at Dublin City Library and Archive, 138-144 Pearse Street, Dublin 2 until 28 April 2018. Admission to the talks is free and on first-come, first-served basis. The Council Chamber seats 110 people and you can bring earphones for enhanced sound. Doors open at 12:30. Rita Brown will talk about Erskine Nicol’s painting “Donnybrook Fair”. Admission is free. Meet in front of the painting in Room 19. A family friendly tour of the “Proclaiming a Republic: The 1916 Rising” exhibition will explore some of the highlights of the Museum’s extensive Easter Week collection. There will be tours at 14:30 and 15:30 and places will be allocated on a first-come first-served basis 15 minutes before the tour starts. Professor Pádraig Ó Macháin from University College Cork will discuss TCD MS 1339: The Book of Leinster. The Book of Leinster contains the largest collections of Irish myth and history from before the twelfth century, including one of three surviving copies of the Táin and the earliest personal letter in Irish. At this month’s Dublin event Debbi Pedreschi of the Marine Institute will talk about ‘Real-time incentives fisheries management’ . Debbi is working to develop a new way of managing fisheries, that takes the ecosystem into account, and would use smart technologies to improve the information coming from fishing activity to help make the science more accurate, while keeping the system simple to use and understand and provide incentives for sustainable activities and methods. Ben Prevo will be for his weekly gig in the Bowery. Expect Blues, Funk, Jazz and even Country. For the Idea Translation Lab, Trinity College students use the Science Gallery as a lab to explore “LEDGES: LIFE AT THE EDGES”, tying in with Science Gallery’s upcoming exhibition of the same name. In the Idea Translation Lab (ITL) course, students will work at the boundaries of art, science & engineering to develop original ideas and projects where these disciplines meet. ITL is a cross-disciplinary undergraduate course stimulating the development of entrepreneurial, creative and critical thinking skills through collaborative group projects. On Wednesday the Idea Translation Lab students will showcase their projects in an exhibition from 12:00 and from 12:30 the presentations and price giving will happen. Admission is free. Find out more details about the projects on the website below. An Easter Family Art Workshop will take place in Collins Barracks on Wednesday for families with children aged 5-12. You can create your own colourful Easter egg window decoration. Inspired by the Museum’s large Decorative Arts collection this workshop will focus on creating a fun Easter artwork that incorporates pattern, line, colour and shape. Rathmines Library will do an “Great Easter Egg Hunt” with Bernie the Easter Bunny on Wednesday. A Teddy Bear Picnic for children under 7 years will take place on Wednesday in Ballyfermot Library. “Great angels in Antrim: Hugh Shearman, Theosophy and Ulster Unionism” is a lecture by Dr Patrick Maume, Dictionary of Irish Biography, Royal Irish Academy as part of the Trinity Research Centre for Contemporary Irish History Seminar Series 2017-2018. On 4 April 1968 at 18:01, Dr. Martin Luther King Jr. was assassinated in Memphis, USA. At the time he was supporting the strike of the Memphis Sanitation Workers for a decent wage and preparing the momentum of the ‘poor peoples campaign’, a huge non-violent march on Washington DC and the Capitol. All Together in Dignity Ireland (ATD) and the Irish End Poverty Day Committee invite you to come to the Famine Memorial on Custom House Quay on to commemorate the 50th anniversary of the assassination of Martin Luther King and to remember his legacy and to commit together to make the dream of social justice come true. There will be songs and speeches. Guest speakers are Peter McVerry sj and Dublin’s Mayor. Diarmuid Ó Gráda is a Dublin planning consultant and he will talk about “Georgian Dublin: The Forces That Shaped The City” in the RDS Library Speaker Series. The Candlelit Storytellers will be in the Harbour Bar telling stories about St. Patrick converting the pagan Irish and what the Pagans gave up to become Christians. Admission is free. Located in the Learning Resource Room, 1st Floor. This drop in event is a storytelling and trail session for kids aged 4+. “Copying the Masters” is the revival of an old Gallery tradition of copying part, or all, of a painting as way of learning about past artists. 16 students from the National College of Art and Design, together with NCAD Lecturer in Drawing and Painting, Kenneth Donfield, will be working from 14:00-17:00 in the Grand Gallery as part of a four week collaboration. And we are invited to come and see them at work and see how they interpret the artists they are studying. “Hands on Design: Hold on to your Hats” is a Drop-in Activity where you will explore the design of hats, helmets and headwear from the Museum’s collection for handling. Admission is free. Suitable for all ages. This event is a tour of the exhibition “Yeats: The Life and Works of William Butler Yeats” on the first Thursday of each month. The tour introduces William Butler Yeats (1865-1939) – one of the great poets of the twentieth century – and his many interests, including literature, folklore, theatre, politics, the occult and Irish cultural identity. After the tour, you can listen to a selection of voices speaking some of his best loved poems, including Easter 1916. The Storytelling of “Horrid Henry and the Tooth Fairy” for children aged 5-8 years will be in Ballyfermot Library on Thursday. The Neurohumanities talk series at TCD will continue with Amy Sterling who will speak about “Citizen Science and Brain Mapping”. Amy Sterling is the Executive Director of EyeWire and Neo, games to map the brain. EyeWire crowdsources neuroscience, challenging hundreds of thousands of players around the world to solve 3D puzzles and map out neurons, allowing neuroscientists to chart synaptic connections and model circuitry. A “Tour for the hard of hearing” where listening devices will be used to increase enjoyment and engagement with the Gallery and the national collection, will take place. The BIMM Music College is organising the Midnight Hour on Thursdays in Whelan’s. The line-up has not yet been announced. The “Hugh Lane First Friday Culture Club” offers the opportunity for engaging with the Gallery’s education, collection, conservation and temporary exhibitions programmes in a fun and relaxed way. There will be talks and they will be followed by tea/coffee and further discussion. This Fridday, the artist Ashleigh Downey will deliver an introduction to Sean Scully’s paintings, mindful observation and meditative walking with insights drawn from her own practice. The Family Tour “CAUTION! Fragile – Irish Glass Tradition in Transition” will have you experience Glass like you’ve never seen or heard it before. It is a chance to take a tour of this new exhibition with Artist in Residence Róisín de Buitléar and explore glass swords, bells and musical instruments on display in this diverse and family-friendly exhibition. Admission is free. Places will be allocated on a first-come first served basis 15 minutes before the tour starts. The Ben Prevo Band will play a gig in the Harbour Bar. Mongrel State will play from Rockabilly to Rock, Latin-American grooves and Cinematic Western Scores. Support will come from Leila Jane & The Healers. Bunoscionn and The Soul Foolishness will play a gig in the Bowery on Friday. First of all, please note that I can’t risk using the word ra pe in its proper spelling, because otherwise spam filters will not let this mail through, so instead I will use “Rp” wherever that word should appear. I am sure you will be able to work with that. I have to admit that writing about the Rp Trial in Belfast is not a cheery subject in the slightest and you could say that it has nothing to do with events or with Dublin, but first of all the “This is Odd!” section in the Dublin Event Guide is an opinion section where I don’t just stick to Dublin or event themes and secondly, I think what happened and the emotional response to it is just to huge to ignore it. BUT, I don’t intend to discuss the trial and its outcomes. Instead there is something much more important and that is what will we take from it and how will we change our attitudes going forward. A quick reprise: Two years ago at a sort of party, a then 19 year old women experienced something that she called Rp (see first paragraph to understand what “Rp” means). The four men that were involved – and yes there was more than one – claimed all was consensual. The trial was done in front of a jury and after 8 days that jury decided that the men were not guilty and at the same time they implied with that that the women was telling lies. The result is that the men walk free, the women involved not get any form of emotional “compensation” for having to go through the trial and the majority of women observing feel (rightly) that not much is done to protect or support them if they every had to experience Rp and therefore many women would probably never report it. A really bad outcome. I didn’t follow the trial in detail and therefore don’t know all that was said by all sides, but I did read the What’s App and text message exchange between the four men and just based on that, I judge them as chauvinistic low lifes who definitely are capable of what they were accused of. There should be consequences for them, but unfortunately I can also see why the trial did result in an acquittal. We have heaps of examples where very clear trials came to very unexpected results. OJ Simpson’s murder trial in 1994 is a perfect example. Everyone expected that he would be found to be the murder of his wife, but he was acquitted by a jury. Another example is the trial against Oscar Pistorius in South Africa. He shot and killed his girlfriend Reeva Steenkamp in 2014 and claimed that he thought she was an intruder. Nearly everyone was convinced that he is guilty of murder, but a judge sentenced him to just 5 years in prison. And there are lots more cases as shocking and surprising as these. A lawyer friend of mine always said that “in court and at sea you are in god’s hand”. I would say “in court and at sea everything and anything can happen” and very very often it is not justice that is the result of a trial. Many think that a trial in front of a jury is fairer, I totally disagree! I would rather have some professionals to decide my fate if I am innocent, but if I am guilty I would love to have a jury. Jury’s are randomly selected, but heavily influenced and influencable individuals with no expertise in assessing evidence and judging a difficult scenario. And if they have the SLIGHTEST doubt they will judge against the accusation. This is what happened here, in my opinion. The outcome might have acquitted the men, but there is a HUGE difference between “not guilty” and “innocent”. The jury might have decided that they are not guilty of Rp, but that doesn’t mean AT ALL that they are innocent. Their Social Media/mobile phone exchanges shows that they are despicable chauvinistic low lifes and unfortunately the acquittal will turn them worse. I read that they now will sue people of libel (damaging their reputation). The trial outcome is what it is, but what should we do now? How should we react to it? In my opinion, the four men should be kicked out of the Irish and Ulster Rugby team with immediate effect just based on the Social Media/mobile phone exchange alone. This is not the way men should be allowed to talk about women and the sports teams have a responsibility to make that VERY VERY clear. We can’t have young people looking up to scum like that. Secondly, we have to make clear that this one case does not mean that all other cases will be decided in the same way. Rosa Parks who – as a black woman – refused to give up her seating in the white section of a bus was the trigger for a societal change. Maybe or hopefully the victim from the Belfast Rp Trial will influence today’s society’s attitude to chauvinists and male low lifes as well! And thirdly, I think we have to make a significant change in the current education of society. In the context with the #MeToo campaign and for education going forward, the “No means No” principle emerged and is quoted in many places also in connection with this trial. I feel this is a totally inappropriate principle. Sure it is better than what many women have experienced until now, but the only principle we should base our education (for all ages!) on is “Only YES gives you the right”. It’s like this: It is not just a RED light that tells you to stop at a traffic light. A yellow light also doesn’t give you the automatic right to race ahead. ONLY the green light allows you to proceed. Our focus has to be on making clear that only a clear YES will give the right to proceed. And if it is not a CLEAR “Yes”, for example because alcohol is involved, then there can’t be a “I assumed it was ok to go ahead”. Oh and two other things: I know one man, a Rugby fan, who celebrated the acquittal of the four and who wrote on Facebook that he knew they were innocent and he can’t wait until they are “in the green jersey again”. Sorry, Sir, you have NO clue how people that you don’t know personally behave behind closed doors and your ignorance and arrogance is disgusting. And lastly: There are good guys out there who would NEVER talk like that about women and who would never treat them in a disrespectful way. I know PLENTY of them! Ladies, please don’t assume that we all are scum! But also, guys, if you hear other guys talk about women like the four from Belfast OR if you come across any disrespectful behaviour towards women or anybody else, please be a man and stand up for the badly treated person! Posted in General | Comments Off on Dublin Event Guide 563: Happy Easter!! – Dublinia Viking Festival, Farmleigh House Easter Events, Mad Hatter Party.